Roshan definitely came to England from Iran. We can be sure he settled in London, we know he liked to play backgammon, and the 70s are a safe bracket in which to place his arrival. Everything else, though, is uncertain: he might have been fleeing the revolution or he might have been sent by his parents; he might have come with only a kettle, he might have had an English language schoolbook (complete or with pages missing), or he might have carried a splendid Persian rug (size unknown). The suitcase that may or may not have contained any or all of Roshan's possible possessions — allowing that it existed, which it may not have — could have been blue. Arguing over the details — Roshan's indeterminate number of sons (in and out of wedlock), the correct inflection of his surname — Backgammon for Beginners has a cast of two performers and an embedded musician who, at one time or another, all claim Roshan as a father. In telling his story they swing in and out of present and past roles, donning where necessary truly awful 70s patterned shirts, Kaveh Rahnama playing the father and the son, Lauren Hendry playing lovers, friends, daughters and less defined roles, and singer Roshi Nasehi, who provides live music from the side of the stage, playing no 'part', exactly, but getting in her own challenges to the unfolding narrative of Roshan's life. We have a picture of him as an outsider. On the Underground he stands at the edge of the platform and holds out his hand to flag the trains down like buses (they stop, so it seems to be working), and when he visits the council estate flat of a relative he wonders at the fact that the family owns, grandly, the whole estate. We don't know much about his life in London, but we do know he played a lot of backgammon, which here is tied in with his apparent promiscuity, the show opening with a tense, silent seduction that plays out to the soft, scuttling sound of rolling dice. The set is in fact made up of giant versions of the points and counters of a backgammon board, and is at once in your face (look out! METAPHOR) and quite low-key, the performers having no soliloquies about luck / chance / game theory. It's got some working room if you know the game (I didn't really) and want to think about it, and if you don't then it quickly merges with the fabric of the larger piece, suggesting something of a man who plays at life — whose only way forward, whose only strategy for success, is to keep rolling the dice. As Roshan's life is told and revised and undermined, Rahnama, in a moment of realisation, as the son, admits that he's never been to Iran; he doesn't know what people have for breakfast there, what the pavements look like. Why is he even arguing over the details? How can he know anything about what Roshan really felt? For me this feeling, or question, is the dead centre of the piece, and it's So & So's patience in working their way towards it — exploring the opposite points of possible narratives before heading for the criss-crossed centre — that makes Backgammon for Beginners a step forward for the company (here directed by Mish Weaver) and, as well, for UK circus, feeling to me like a pivotal point where the representational style that's characteristic of many graduate companies has synthesised with a nuanced understanding of circus as a figurative language. 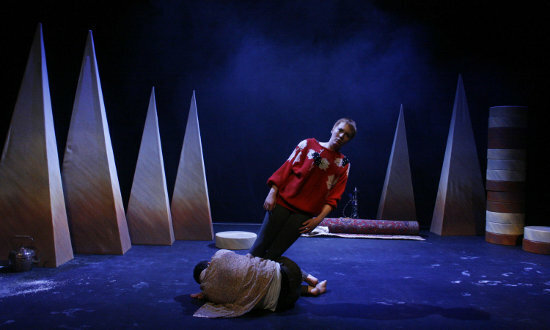 Early on the piece has its elements of physical literalism — acrobalance to create a leaning tower, simple acrobatics from a fidgety child listening to her father's stories — but shifts into an abstract mode at the same moment that the waveform of truth-or-lie playfulness collapses into something tangled and compromised and (true or not) very real. There's a fight, a crisis, Hendry screaming silently at Roshan over his infidelity, and then a long acrobatic sequence that sees Rahnama, as base, passively driven through the choreography. Hendry, whatever woman she is now, stands on his shoulders and leans to the left and it's Rahnama, underneath, who loses his balance and stumbles to the side; she leans right and again he is directed. The company have developed material outside their vocabulary as a hand-to-hand duo and the physicality here is intense and unpredictable — Hendry, in one simple and striking moment, standing on Rahnama's face, feet over the eyes, pressing his skull into the ground. The whole sequence is strong; I can think of it and feel it now — the man, the immigrant, divested of his awful shirt, still in his awful trousers, sweating, wild-eyed and desperate, lost at the front of the stage. If it were a play, Backgammon for Beginners would speak only of how slippery family history can become, and of the hunger that, looking back to a parent's past, you can feel for facts — outward signs to direct you to the person you realise now you never knew. As a circus production with full control over its own abilities, however, it reaches beyond that towards the sorts of gut feelings that points of data can't describe. In the end circus says it best: arriving in '75 or '76, virgin or Casanova, laden with rugs or robbed blind by a taxi driver — what comes through, finally, is bewilderment in the face of change and consequence, the unresolved sense of knowing and not knowing, the feeling of having no ground left to stand on.